Come September and it’s time for us to witness a technical overdose in the form of TECHNICHE the annual techno management fest of IIT GUWAHATI. Started fifteen years ago in 1999,techniche was conceptualized with an aim to motivate the youth of our nation to think out of the box, expand their horizons and reach the zenith of success in all techno-management spheres. It has stayed true to its vision since; and from its humble beginnings. Techniche now revels in being one of the premier techno-management festivals of the nation. From 4th of September to 7th the fest takes you to the best of technical and cultural marvels as well as honing the new aspiring minds that are to become the future of the nation. With major attractions like Lecture series, Industrial conclave, Technothlon the international school championship, Predefined competitions , Robotics, Online events being introduced for the first time, this Techniche promises to be the best in 16 years. 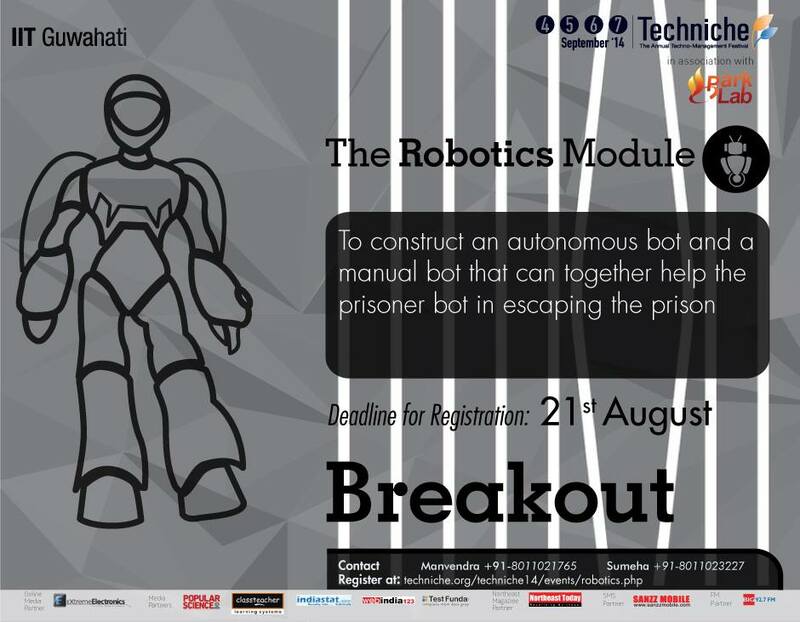 The most participated and attractive module of this event is Robotics, the breath and soul of modern day technology. With up to 3,50,000 INR at stake as prize money, the competition is all set to rock the minds of all tech enthusiasts over the nation and will give an opportunity to showcase their talents and absorb knowledge through one of the best techno-management festivals around. Taijitu War: Inspired from the popular Japanese culture with Yin and Yang, meaning destroyer and creator, the aim is to make your own place, protect it from destroying and at the same time and also destroy others’ area. The final survivor wins. Robokick: Getting right into the mood of the coming football fever, this event will check the football skills of your robot. Participants have to design single robot that can both kick the football into others’ goal post and at the same time be a good goalkeeper. Robocalypse: To design a robot which can immobilize the opponent’s robot. Your robot has to be strong enough to stand amongst others which try to put yours down. Breakout: To design a line following robot that can follow a line and perform a desired task. The task is to construct a line following robot and do the given jobs in the foreplay. Hue Down: To design a robot that can do image processing and perform specific task. Design an autonomous bot that uses image processing to locate the block of different colors and to put the block in respective color zone. And then, there is the Prelims round of Escalade, an all India robotics championship which extracts the best of possibilities for a pole climbing robot and tests the real temperament of a robotics developer. All the events would be conducted in IIT Guwahati campus and accommodation would be provided to all the participants. The participants have to make their own bots and purchase all the necessary items themselves. The event is well supported by Cocubes.com, a very useful site for college students. The participants may also contact organizer Sudheer Kumar for further queries at 08473994859 or mail at [email protected] . When to start IIT JEE Exam Preparation ?